The normal tyre has been adapted over the course of a century to be pretty damn good at carrying people places. But from time to time they still break. 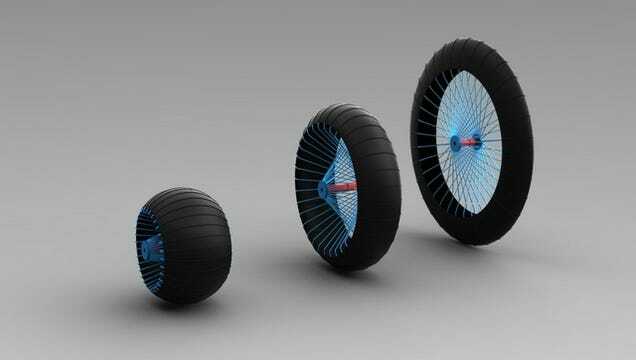 Ackeem Ngwenya is a Royal College of Arts graduate who has been working on his expanding wheel concept for a few years now. I met him two years ago, when his design prototype was built out of paper, sticks, and a few 3D-printed components. The current evolution stays fairly true to the original design principles: using a scissor-jack mechanism, the wheel can become smaller and fatter to increase grip, or larger and thinner for better paved surfaces. Internal structure comes from a series of spokes, which attach to a central hub, and are then tensioned by pushing the spokes in or out, allowing the wheel to contract or expand.